Dog sledding is a wonderful experience, where you get close to nature and also get a good sense of speed. Whether you are sitting on the sled or standing behind and controlling, it is fascinating to have the great interaction with both the dogs and the surface. If there are dogs that love both, and are good at it, it is time to up the tempo and drag the sled over the snow as fast as they can. A couple of quiet calls from the tour guide make them turn left or right, and they will not continue until they calm down and run at a lower tempo. Snow, wind and sounds get even closer when you glide across the snow behind the four-legged horsepower. We almost want to say that no matter how long you travel, you would like it to be “a bit longer” when it is over. Whether you are a bunch of friends, a family, or a small business who wants an exciting natural experience, dog sledding is a great recommendation. 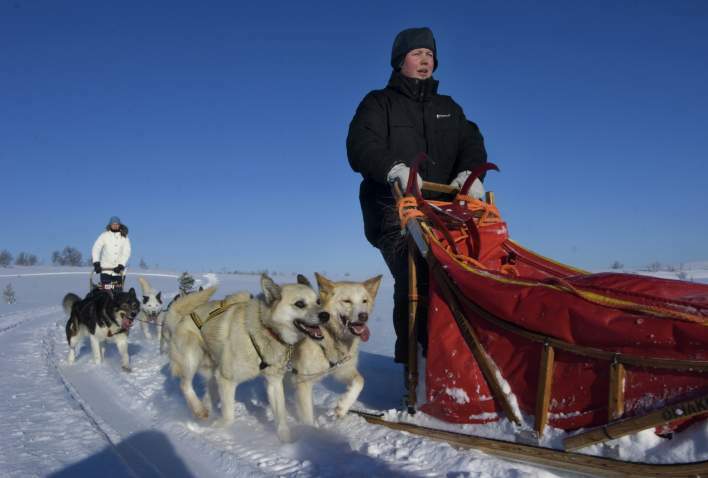 Dog sledding is offered at Røros, in Meråker, in Røyrvik and at Steinkjer. What to wear: Warm clothes, windproof jacket, wool under windproof outerwear, hat and gloves. Røros, one of the oldest wooden building towns in Europe. Located 628 metres above sea level. Founded in 1644, and was one of the most important minin towns in Norway. Røros was added to the UNESCO World Hertage List in 1980, and was certificated as a "Sustainable Destination" in 2013. By plane: Røros Airport is only 2 km from the town of Røros, and is only a 50 minute flight from Oslo. Trondheim Airport is a 2 hour 45 minutes drive from Røros. By train: There are daily depatures both from Trondheim and Oslo. From Trondheim it takes about 2 hours. By bus: It takes about 5 hours from Oslo and 2 hours from Trondheim. Distance: From Oslo: 384 kilometres, 5 hours 20 minutes. From Trondheim: 157 kilometres, 2 hours 10 minutes.